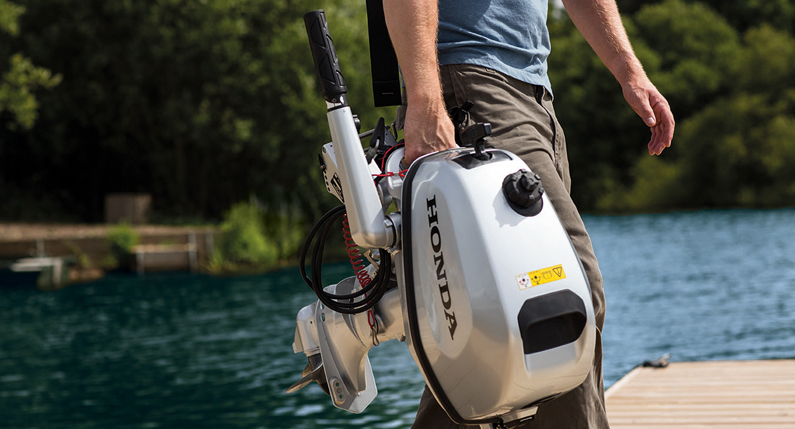 Honda has launched three new portable outboards: the BF4, BF5 and BF6. With weights starting from just 27kg, combined with a new carrying handle design, they’re very easy to transport and store. The tiller handle can be fully folded to make the unit even more compact. These engines are equipped with a Honda’s decompression mechanism, which makes starting the engines a breeze whatever temperature of the engine. For boaters who are sick of getting a tingly arm from harsh engine vibrations, there are new rubber engine mounts integrated into the outboard to absorb practically all vibrations across the rpm range. Hidden under the cowl is an additional 1.5L of fuel, providing up to 43 minutes of travel at WOT. The BF5 and BF6 can also be connected to an additional external fuel tank. These engines share the same 1-cylinder -127 cm³ engine block and benefit from Honda’s industry leading 4-stroke technologies. The new models are available in short (15”/38cm) and long (20”/51cm) shaft.